The sweet moment of coming back home. What a happy moment when you are coming home after long-long travel! Still in the train you are looking through the window with the hope to see your native hills or some other special places. The train stops. You go out to the fresh air of your childhood memories. Everything is so familiar!.. Your home town is in the blissful sunny shining like the Promise Land. With the exciting feeling you are stepping on the platform when in the crowd of station you see the dearest faces of your mama and papa. They are smiling at you the same as if you were their little child... Maybe you are still in the hugging arms and your happiness is full when you are looking back and see that there runs to you your Mary: "hair of gold and lips like cherries"!.. Everything is the same. So much the same that you are wondering! Even your old home where you always had a shelter in any weather of your life... Though the house needs to be painted but it is the best place in the world! Your oak tree is still there, where you used to play with your dear Mary. She is so sweet as many years ago. Your best friend of your childhood games. These grey walls are not the "green green grass of home". With opened eyes we even cannot imagine that. No sweet Mary and happy days. Just maybe only heart can save the all treasures of sweet memories. And no one can steal them or wipe off. We can play near the oak tree being surrounded by grey walls. We can meet our dear ones without seeing them. And to feel how "it is good to touch the green green grass of home". Review of the song "Green Green Grass of Home". ٭ The song "Green Green Grass of Home" was written by Claude "Curly" Putman, Jr.. It was released in 1965. 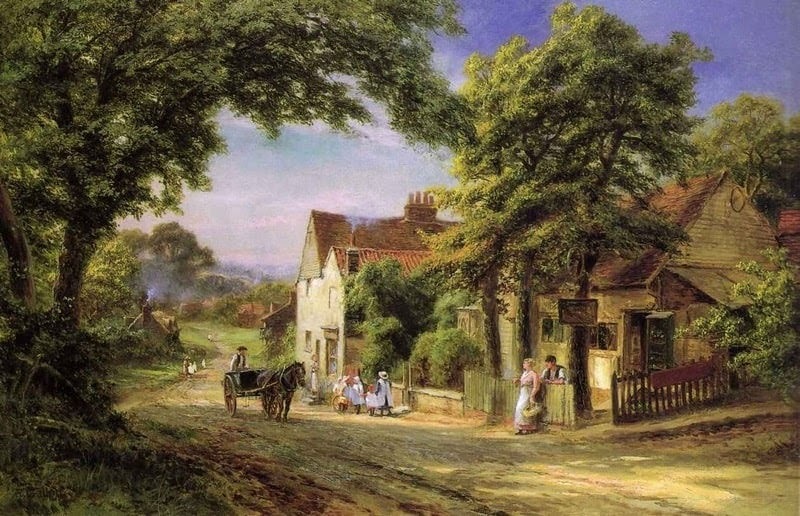 # Painting "A Village Scene" by Robert Gallon (1845-1925).